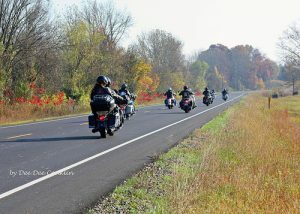 A last minute decision, the trip was still a well planned trip with several other riders joining in. We had meal plans, road map plans, fishing plans and camp site plans. The motorcycles were tuned up and polished. The gas tanks were full and the tires had air. The bikes were ready and so was I. Early morning came and we headed out. The roar of the engines was magnificent. As I listened to the well tuned machines my heart raced with excitement. I was pumped up. As we started to ride the bright morning sun warmed me through my shirt. I felt the heat on my arms and the dry air on my face. While riding out of the neighborhood I could hear the wind in my ears and the smell of the city in my nostrils. My five senses came alive.We were off to cross the continental divide to our final destination. The fantastic experience of being totally present in the here and now swept over me. All worries of yesterday and concerns of tomorrow faded away. Riding reminds me of how important it is to be in the moment. Riding is an exercise in mindfulness. The city’s edge was barely behind us before the scent of the air changed to the moist smell of farmland. Penetrating my nose the earthy ground of worked fields talked to me. I settled into a peaceful knowing of being connected to the universe. Feeling nature around me quiets my soul. My thinking becomes clear. I want to encourage you to find those things that speak to you. Those places where peace within is re-discovered. How do you create that space in time where you can hear your inner wisdom? Check back next week for more treasures of the road.